Search engines are notorious for their inability to update quickly, the idea of the search engine spiders being able to crawl the entire web for new pages at a moments notice was simply unfathomable. The power involved in searching the entire internet and keeping the search engines as close to real time as we know them is incredibly vast and that is nothing in comparison to what updating the internet in real time would take. But, now Microsoft’s Bing has decided to latch on to what is by far the best opportunity to do this and get one over on its competitors. And that opportunity is the social networking sites Twitter and Facebook, they’ve been providing updates about, well just about anything you could imagine for a few years now in the form of tweets and status updates and ok organising the entire web in this manner is a far more monumental task which is yet to be achieved, but what Bing is beginning is a step towards this by amalgamating its services with the social networks to add their updates to its search. The fear of course is that the search engine will be flooded with more useless information and dribble which is about as useful as the average user as a chocolate tea pot (this is a British colloquialism if you’re American and don’t quite get it). 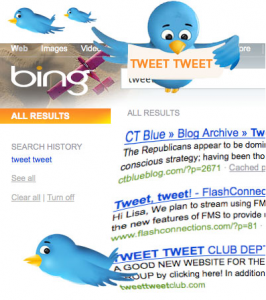 So the idea was to separate the two for now into Twitter Bing and the original Bing. This may be a permanent set up or the conflation of the two services could be coming soon if Microsoft can get this right. This clearly is something that had to come soon, the fact is that search has to keep up with the booming markets online and the social network is the internets fastest growing niche. And this search engine will let you search twitter feeds as if they were websites, a weird concept but one that for many has been a long time coming. Google however are in talks with Twitter and Facebook to produce the same service so while Microsoft haven’t quite had enough time to corner this late branch of search, but they have got the edge. So will it catch on? Or will the search engine bosses look like a bunch of twits? Only time will tell, but if you fancy giving this service a try you can test Bing’s American beta already. How is bing supposed to go real time when it can not even index a large site? I have a forum with 80,174 Threads and 1,057,259 Posts. Even with submitting a sitemap to my bing webmaster tools, it only has indexed 973 pages. If Bing can not index a large site, how is it “supposed” to offer quality search results and in “real time”? Personally, I think that bing is over rated and over hyped.